★☆☆☆☆ This camera works great with the Echo Show. However, I do use it on occasion with my two Echo Spots. But, the round screen of the Spot does cause you to loose some of the edges of the video display. Whereas, the wide screen of the Echo Show displays the entire video picture.I originally tried using the Arlo camera and I found that the connectivity of the Arlo to the Echo devices is a little to inconsistent. I would ask the Echo devices to show me the front door and Alexa would say “Hmm the camera isn’t responding” on the first try, but would connect about 85% of the time on the second try. Sometimes it would take two or three tries. This occurred even after connecting the Arlo base station to my router using a cat 6 cable and placing it directly underneath the camera. And so weak WiFi did not seem to be the issue. Arlo just did not play well with Alexa.This camera even without a base station is in the exact same location as the Arlo camera and it still connects with Alexa on the first try every time so far. 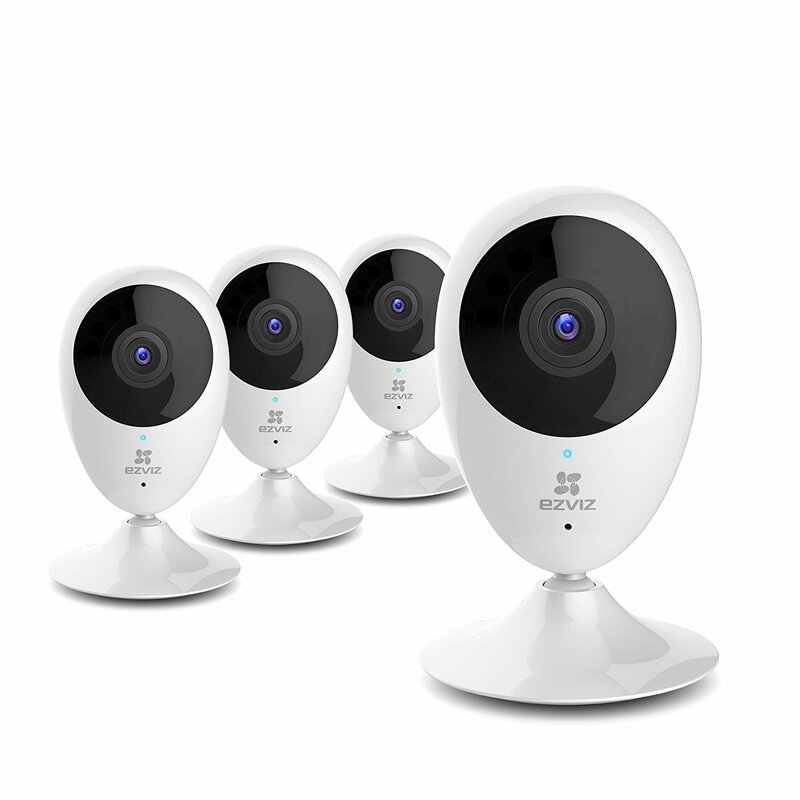 The two of them play well together.The advantage to the Arlo over this camera is that the Arlo uses batteries and so it can be placed almost anywhere. However, the battery life is a bit of a problem. After just 4 days I had depleted 38% of the batteries juice. Arlo Pro and Arlo Pro 2 do come with rechargeable batteries. But, depending on where you place them you could end up spending an awful lot of your time going up and down a ladder changing batteries.The only gripe that I have with this camera in comparison to the Arlo is that the Arlo will send you email notifications whenever it is triggered, whereas the EZVIZ Mini O only alerts your smartphone. If they could clean that up I would give the EZVIZ Mini O 5 Stars. "Update: June 17, 2018"After living with four of these cameras for about one month I have to lower my original Four Star rating to a One Star. This is due to the issues with connecting these cameras. Once I originally connected the cameras, something that took hours to do, I was quite pleased with the quality of the video and I still am quite pleased with that aspect of the cameras.The major issue that I have with this camera as well as the EZVIZ Mini 360 is the issues with connecting them to my wifi network.I was never able to connect the Mini 360 to my wife, I had to run a ethernet cable to through the attic. I like the camera it simply would not connect to the wifi.If for any reason I have had to move the camera to a new location I must go through the extremely frustrating process of reestablishing the wifi connection. If the power goes out for any reason, you will have to start over and reconnect to the wifi network. I am in the process of installing Legrand outlets and switches throughout my home and so I am constantly turning off the power in different parts of the house and so when I turn off the power in an area where a camera is located I have to reestablish the wifi connection. Ugh!I am not certain if it is a matter of which company you get your wifi from, or, if that the cameras simply are not ready for Prime Time. Some folks have a great experience with the cameras and have no issues with connecting them to wifi and others go through the nightmare of trying to connect these cameras. EZ should stand for easy to install and operate, but that is not the case.The little instruction booklet that comes with the cameras is of little help. An online link perhaps with videos that users can access would be very helpful. This could also cut down on the returns of the product. My return window for three cameras closed four days ago and I have two days remaining on one camera.My best advice would be that if you have issues from the start connecting the cameras, you should decide then if this is something that you want to continue to deal with. Because once the return window closes, they will be your problem, FOREVER!I am not trying to discourage you from buying this product because some people do in fact have a great outcome. I am simply trying to forewarn you that this could a very frustrating experience if you fall into the group that has had issues connecting these cameras. I can attest to the fact that connectivity issues are real with these cameras. I am pretty savvy when it comes to these things and I simply want to give you a heads up to this issue.After all, these reviews are intended to help all of us make an informed decision prior to us investing our money in a product. ★★★★★ Pleasantly surprised at the quality of the camera, ease of setup, picture quality, and night time performance.Bought this as a second camera for use with our baby to use as baby monitor. When we don't need a baby monitor anymore, we'll use our as a security camera.Setup was a breeze. No issues like before with their previous model. Seems the manufacturer fixed those problems.I definitely like the long cable it comes with. Made for more mounting options, even up on the ac vent.I was surprised by the wide angle as it previous one wasn't quite as wide. I actually can see both kids with one camera now.Lastly, night time performance. This model only has one IR light that I thought would affect night vision, but I cab see everything in complete darkness. Just had to make sure the white wall didn't throw off the camera. The trick is to point the camera away from the wall. The old model had a ring of IR lights which was far more noticeable and distracting at night. This one is pretty subtle.Last feature I like is that the status lights can be turned off.Overall, great camera, far better price than the name brands. ★☆☆☆☆ Just like a few others on here have posted, I could not get this thing to connect to anything, in anyway. It is funny to note, that even thou it is the exact same app, my phone & tablet had very different things the app was having me do for each.I went thru all the steps and every type of way to connect: Creating a barcode and having the cam scan it. Creating a sound and playing it to the camera's mic. Pushing the credentials to the cam (although it never tells you if it is using NFC, Bluetooth, WiFi Direct?). Either way, my phone and tablet support all those methods and following the instructions of keeping it within 2" (sounds like NFC to me) it did not work. And finally connecting to the cam thru ad-hoc, which following the directions, the cam never does.I have no idea why this camera seem to work for a few people that have posted a good review for it. At least some of them do appear to be regular amazon users. Hard to believe that EZVIZ would have this high of a defect ratio - mine was brand new, I broke the seal. IDK. All I know is I have spent over a hour screwing with this and it has pissed me off. And I am a very tech savy person, so something is wrong with the device or their BS setup. I'm guessing it is their setup of how to do things.And before Carl the copy & paste spammer replies with "change your 2.4GHz setup to a slower speed". You don't change speeds, you change connection standards. And I did go so far as to setup a new SSID just for it, on the old 802.11g standard. Still nada!